← Get Ready to POP this weekend! 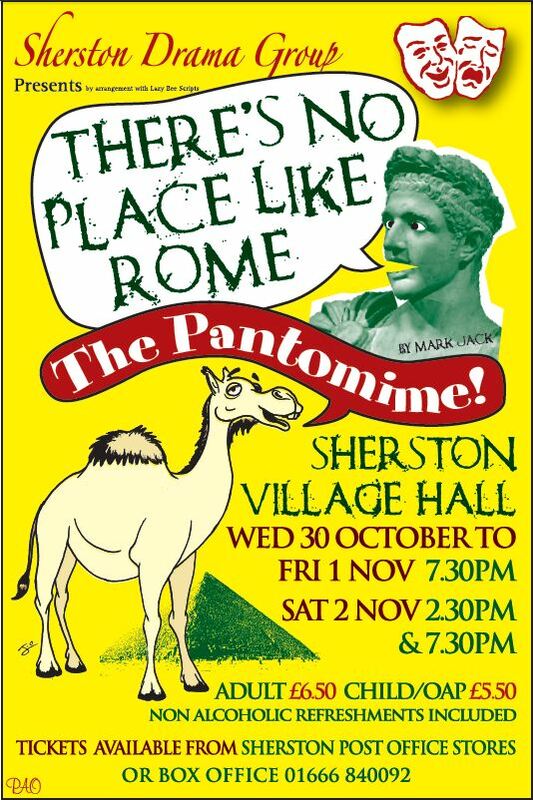 Sherston Drama Group are putting on their annual family pantomime at the end Of October in Sherston Village Hall. This year they are Performing “There’s No Place Like Rome” by Mark Jack. Set in Rome and Egypt, and featuring the usual cast of a dame, heroes, villains, village idiots and of Course Camilla the Camel. This is a hilarious romp, through a slightly different version, of the history of the early Roman Empire and is one definitely not to be missed. Performance dates are every evening (7.30pm) from 30th October to 2nd November with a saturday matinée at 2.30pm as well. Tickets are on sale now and can be purchased from Sherston village Post Office or from the box Office on 01666 840092(evenings). Ticket prices are unchanged since 2010. £5.50/£6.50 including refreshments.